Bicycling lets you have fun and get exercise while being kind to the environment at the same time. It can also be a great way to run errands, commute to work or experience a backcountry trail, not to mention more serious pursuits such as touring or racing. Whatever your goals, you have a number of bicycle options to take you there. The aim of this article is to help beginners, casual riders or those who haven’t ridden in a while to select the right type of bike for them. What’s Your Primary Riding Style? Your first consideration is to know where you’ll be riding: on pavement, dirt trails or both. Some bicycles are made specifically for a particular kind of riding surface, while others are versatile enough that, perhaps with a quick tire change, they can be ridden in more than one category. To get you started, here is a general breakdown of the different kinds of bikes that REI carries. Within each of these categories are individual models that emphasize performance, versatility or comfort. Description: Generally lighter in weight than the typical mountain or comfort bike, road bikes are good for multiple pavement uses including fitness riding, commuting, long-distance/event rides, touring and racing. They are suitable for riders ranging from novices to seasoned enthusiasts. Proper fit for most road bikes is particularly important, as a poor fit can be uncomfortable or even painful. In addition, a poorly fitting road bike can also reduce the efficiency of your pedaling. Some models are built for speed with a more aerodynamic riding positioning, while others provide a more upright riding position. Road bikes may include racks, lighting systems or fenders for commuting or touring use. Prices range from $500 to $2,000+. Drop-bar handlebars are lightweight and aerodynamic and are a better choice if you want to go faster or are more concerned with efficiently transferring your energy into making the bike move forward. They also allow for a greater number of riding and hand positions than flat-bars. Their more aerodynamic riding position (bent over at the waist) may put more strain on your back if you are less flexible. Flat-bar handlebars combine the efficiency of drop-bar road bikes with a slightly more upright riding position. This allows you to sit up in a higher and more relaxed position so you can better see the road and potential hazards. An upright position also reduces strain on your hands, wrists and shoulders. This increased versatility comes with the tradeoff of being slightly less efficient (from an aerodynamic standpoint) than the typical drop-bar road bike. Best for: Dirt or rocky trails and gravel roads; OK for pavement too (with tire change). Description: Designed with shock-absorbing features and better braking systems, mountain bikes can handle dirt trails and the rocks, roots, bumps and ruts that come with them. They feature lower gears than most road bikes to better handle steeper terrain. Mountain bikes can be a good choice for commuting because they can withstand potholes while still providing comfort. However, the smaller diameter wheel (26 inch) of traditional mountain bikes is less efficient on pavement than the larger diameter wheel (700 millimeter/27 inch) of a road bike. Hardtail bikes feature a front suspension fork and a rigid back with no rear suspension shocks. This type of mountain bike is much less expensive and lighter in weight than a typical full-suspension mountain bike. A hardtail is the more versatile choice if you plan to use it for both paved and unpaved surfaces. The tradeoffs from a full-suspension mountain bike? A hardtail is less able to safely handle more technical singletrack trails, provides less overall shock absorption and, in some situations, delivers less rear wheel traction. Full-suspension bikes have both front and rear suspension shocks making them ideal for backcountry trails or technical (steep, bumpy, twisty) singletrack. They also stand up to more aggressive riding including jumps or drops of up to 5 feet. As mentioned above, full-suspension bikes are more expensive and generally heavier than hardtail bikes. Best for: Pavement or gravel/dirt roads. Description: These bikes emphasize comfort and ease of handling. They are ideal for riding around flat neighborhoods, parks and bike paths. Some styles offer bigger wheels for an extra-smooth and efficient ride and many feature front suspension forks as well. 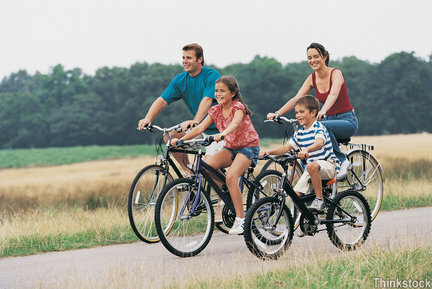 These bikes are good for general riding, casual family outings or those who haven’t ridden in a while. Comfort bikes are aptly named. They feature slightly wider 26-inch tires than other pavement bikes, a comfortable seat and a very relaxed sitting position. Many styles also offer a suspension seatpost that compresses when you sit on it, providing extra comfort and shock absorption. Some comfort bikes even have internally geared rear hubs for easy maintenance. Hybrid bikes aim to offer the best of the road- and comfort-bike worlds. While they have a comfortable seat, upright sitting position and (often) suspension forks and/or seatposts, they also offer the more efficient pedaling of 700-millimeter (700c) wheels versus the comfort bikes with 26-inch wheels. These are a good choice if you want to commute to work and enjoy leisurely rides through the park. Best for: Pavement or some gravel roads. Description: Designed with city streets in mind, urban bikes are rugged and sturdy with tough frames and strong wheels. They feature an upright riding position that allows you to better see, and be seen by, motorists. Many commuter-friendly models include racks, lighting systems or fenders. Best for: Those who have the more typical woman’s body proportions of longer leg length relative to torso length. Description: These bikes—which can be road, mountain, comfort or hybrid bikes—feature frame geometries, handlebars and wider saddles that are tailored to better fit the typical female body proportion. For instance, the top tube frame lengths on women’s bikes are generally about 1 to 3 centimeters shorter than men’s bikes, so the reach (saddle to handlebar) is shorter and fits most women better. These bikes also feature shorter-reach shifters that better fit women’s hands. No matter what type of bike you choose, make sure it fits you. Bikes are sold in a variety of frame sizes, so this is a good starting point. To find the frame that best fits your leg length, try this simple stand-over exercise: throw your leg over the bike’s top tube and straddle it. Generally you want about 1″ of clearance for a road bike and about 2″ or more for a mountain bike. Recreation and comfort bikes generally offer plenty of stand-over room already. Wear shoes to get an accurate reading. Now consider the seat height. You want to make sure your leg has a slight bend when your pedal is at its lowest point in its rotation. To achieve this may involve making simple up or down adjustments to the seat height. You should also have the proper reach to the handlebars. Your arms should not be fully extended; rather, your elbows should be slightly bent so that you feel comfortable and not too far away or too close to the handlebars. From bikes with training wheels to teen-sized versions of adult bikes, there are many options available for kids. The most important consideration when buying your child a bike is size. When shopping, keep in mind that children’s bikes are measured by their wheel size, not frame size. The most common wheel sizes are 16″, 20″ and 24″. The right size is one where the child can comfortably get on the bike and stand with his or her feet on the ground. It is not recommended that you buy a bike that is too large for a child and then have them “grow into it.” Doing so can set the child back in terms of riding skills and confidence. A properly sized bike will be easier for kids to handle, less dangerous and a lot more fun. And don’t forget the helmet!